Scents & Senses In this workshop art and alchemy meet. We work with the energy of Radiant Beauty, Harmony and Bliss. These delightful energies will each be misted above your head in the form of bright delicately scented energy sprays. 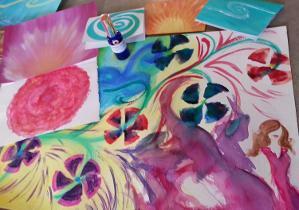 Each energetic mist hand made using pure and natural essential oils combined with flower and crystal essences. In each enlightening experience you will be guided into expanded awareness then through a creative painting process to create three intuitive and unique works of art. Imagine gifting a friend with the energy of HARMONY infused in a card. Uplift your home hanging your unique expression of RADIANT BEAUTY for all to see. Or create a sense of Peace in your bedroom or studio hanging BLISS. This workshop will provide a unique, relaxing and creative experience. No art experience neccessary. This special summer date is for you and your child, niece, nephew or grandchild. A day to remember.